In January, bookseller Bernard Rosenthal passed away in Oakland, California, at the age of 96. Rosenthal was born in Munich in 1920 into a family of booksellers known throughout the industry as the “Rosenthal Dynasty.” Part of the massive exodus of Jewish antiquarian booksellers from Germany during the Nazi regime--the “gentle invaders” as Rosenthal called them--he ended up in New York, where he set up shop in the 1950s. Rosenthal eventually moved to Berkeley, where he focused on medieval manuscripts and early printed books. (For more on Rosenthal and fellow emigré booksellers of the early 20th century, read Nick Basbanes’ chapter “Hunters and Gatherers” in Patience & Fortitude.) Rosenthal’s catalogs became the stuff of legend in the antiquarian world, in which he described easily overlooked details and craftsmanship that only came to light after careful examination of the item at hand. “We have committed the cardinal sin of the bookseller: we have READ most of these books...which has, however, brought some surprising results,” Rosenthal wrote in one of his early catalogs. Now, in memoriam to Rosenthal and his life’s work, California-based booksellers Nick Aretakis, Ian Jackson, and Ben Kinmont have recently announced the publication of a new biography. Entitled Bernard M. Rosenthal (Berkeley: The Wednesday Table), the book examines Rosenthal’s contributions to the antiquarian bookselling trade. Written by fellow bookseller and longtime friend Ian Jackson, the bibliography traces Rosenthal’s life and career, while also highlighting the bookseller’s ability to thrive in a notoriously difficult and expensive industry. Hand-stitched in printed dark-gray wrappers, printed on letterpress by Richard Seibert, and issued in a limited-edition run of 400 numbered copies, the folio-sized book is available for $60. Contact Nick Aretakis at naretakis@mindspring.com, Ian Jackson at jancosinka@gmail.com, or Ben Kinmont at bkinmont@gmail.com to order. Required reading for antiquarian booksellers and historians alike. In January, bookseller Bernard Rosenthal passed away in Oakland, California, at the age of 96. Rosenthal was born in Munich in 1920 into a family of booksellers known throughout the industry as the "Rosenthal Dynasty." Part of the massive exodus of Jewish antiquarian booksellers from Germany during the Nazi regime--the "gentle invaders" as Rosenthal called them--he ended up in New York, where he set up shop in the 1950s. Rosenthal eventually moved to Berkeley, where he focused on medieval manuscripts and early printed books. (For more on Rosenthal and fellow emigré booksellers of the early 20th century, read Nick Basbanes' chapter "Hunters and Gatherers" in Patience & Fortitude.) Rosenthal's catalogs became the stuff of legend in the antiquarian world, in which he described easily overlooked details and craftsmanship that only came to light after careful examination of the item at hand. "We have committed the cardinal sin of the bookseller: we have READ most of these books...which has, however, brought some surprising results," Rosenthal wrote in one of his early catalogs. Now, in memoriam to Rosenthal and his life's work, California-based booksellers Nick Aretakis, Ian Jackson, and Ben Kinmont have recently announced the publication of a new biography. 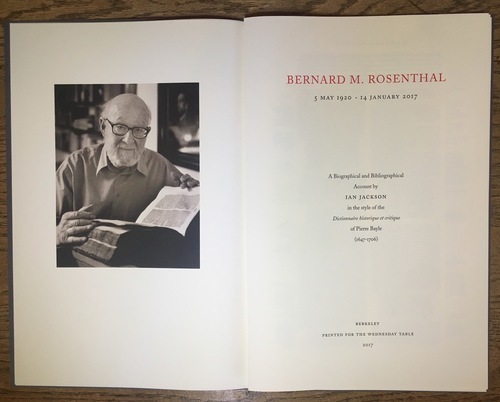 Entitled Bernard M. Rosenthal (Berkeley: The Wednesday Table), the book examines Rosenthal's contributions to the antiquarian bookselling trade. Written by fellow bookseller and longtime friend Ian Jackson, the bibliography traces Rosenthal's life and career, while also highlighting the bookseller's ability to thrive in a notoriously difficult and expensive industry.